Hello faithful readers, and good news: you can cancel the search parties. I’m alive. And I’ve got a new book for you—even better, it’s the start of a new series in a familiar world. 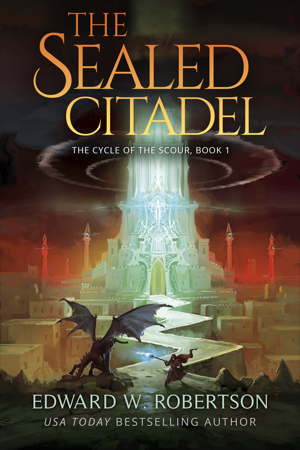 THE SEALED CITADEL is set in the same universe as the Cycles of Arawn and Galand, but in an earlier time. A much different one. A time when Cally, the man who would later mentor Dante Galand, is just a young sorcerer himself. Yes, that’s right. It’s about Cally. This is the first in a new series of what will probably be three or four books. To get it off to a nice start, and for fun, it’s currently just $0.99 on Amazon (UK version here) or can be read through Kindle Unlimited. It’s out on paperback, too. Audiobook questions: will there be one? Yes. Will Tim Gerard Reynolds be narrating? Also yes, and it should be awesome to hear him voice young Cally. I think he’s slated to start recording any day now, so that ought to be out sometime this summer. Using my almighty power of “having done this for a while,” I foresee another question: Galand #6? Yep, on the way—in fact, I’m almost done with the first draft, so expect the ebook in June, with Tim starting the audio narration shortly thereafter, making for a probable autumn release. Starting a new series is always both exciting, but also a total gut-wrencher. You never know if it’s going to take off, or, to paraphrase a wise robot, flop like an automated flopping machine. With that in mind, I am extra grateful to everyone who picks this one up. Getting to write Cally’s voice again was a blast. I’m excited to see where the rest of his story leads. Just in case you somehow missed the title of this post yet clicked on it anyway: yep, THE SPEAR OF STARS (The Cycle of Galand #5) is now out on audiobook. You can get it on Audible, Amazon, and Apple. A VERY IMPORTANT NOTE THAT YOU MUST READ IF YOU ARE GETTING THIS: Many people are reporting experiencing a very charming technical error from Audible, which is that the audiobook’s chapters are out of order. This isn’t impacting everyone, and in fact they might have fixed it already, BUT—if your version starts in the middle of a big huge battle with the Blighted, or if chapter 1 seems normal but chapter 2 jumps into a big huge battle, YOUR COPY IS OUT OF ORDER. Fortunately, the fix is very simple: just delete your copy and redownload it. That”s worked for everyone I’ve spoken to. That out of the way: as always, the book is narrated by Tim Gerard Reynolds. I hear that people like this book, especially in audio format. If you liked the previous books, chances are you’ll like this one too. As with the rest of the series, the audiobook is WhisperSynched to the ebook, meaning that if you’re buying it with cash rather than a credit, you should be able to buy the ebook and then get the audiobook at a discount (about $7.50) that comes out to about the total cost of an audiobook credit. If that’s your thing. Using my magic powers, I foresee that many of you are now asking when book #6 will be out. Well, I’m currently in the “think through the plot enough to not totally screw myself two-thirds through the book” stage. This phase is especially important to me on this one because I intended to put significantly more plot into THE SPEAR OF STARS but then more and more unexpected details kept cropping up and some of that plot got pushed into book #6. WELL NOTHING! For there are three things that must happen in book 6, and by its end, those three things shall be done. I just have to spend a little extra pre-writing time thinking them through. But I hope to start writing within a week. It’ll take me 5-6 months from there to have the book finished and ready to publish, so expect the ebook this spring, with the audiobook following that summer. But hmm…this raised another question, doesn’t it? The question of what the lazy author has been doing since June when his last book came out and why he did not start Galand #6 months ago. Well the answer is I wrote another book. A book about Cally, Dante’s old mentor, when Cally is a young man just learning the ways of the nether. It’s set a little over a century before The Cycle of Arawn, and it’s all written and finished. Just needs some proofreading and a cover. It should be out sometime in November or December. Which raises one last (two-part) question: audiobook? Tim? Yes: there will be an audiobook, yes it will be published by the same team as the others (Podium), and yes they’re in the process of scheduling Tim to narrate this one as well. It will be a kick to hear him de-age Cally’s voice from Arawn. As busy as Tim is, I’m not sure how soon he can get to it, but I’m thinking it’ll probably be out sometime this spring. All right: this is getting long. In summary: audiobook out, next book not too long from now, surprise prequel book very soon. Over and out. 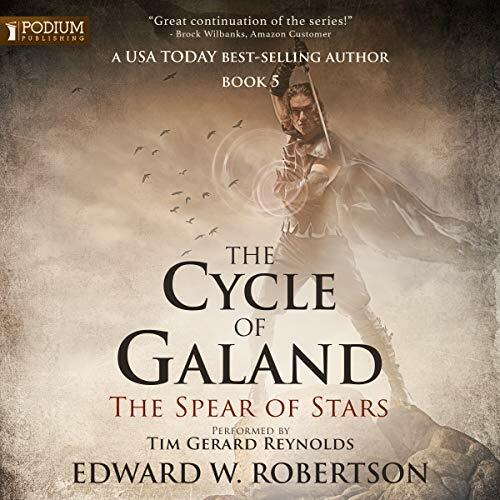 THE SPEAR OF STARS is now live on audiobook. HOWEVER, a lot of people are reporting a technical problem with the chapters being out of order. If it starts on chapter 17, or in the middle of a big battle—or if chapter 2 throws you into chapter 17/big huge battle—your chapters are out of order. Several people have told me they fixed it just by deleting the file and redownloading it. If you run into this problem, give that a try. If either chapter starts instead with the Blighted running through the grass, the book is out of order. In which case, delete + redownload. My publisher’s already working with Audible to get this resolved, but figured I’d better give you all a heads up, as this has confused more than a few people already—myself included! Will update with anything new. 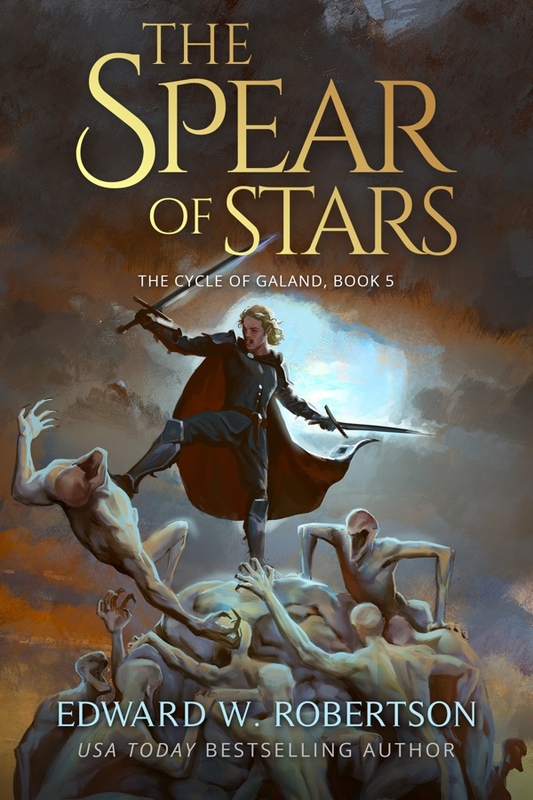 THE SPEAR OF STARS: The Cycle of Galand #5. You can pick it up on Amazon, Amazon UK, and paperback. And yep, it’s currently enrolled in Kindle Unlimited. 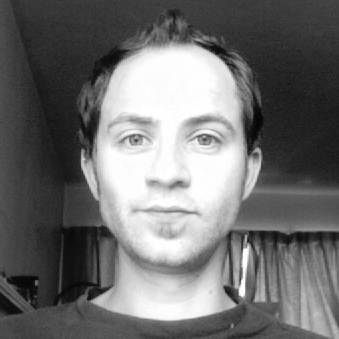 Tim Reynolds is working on the audiobook recording as we speak. With any luck, it’ll be out in August or September. This is the longest book in the Cycle of Galand by a good bit—637 pages, just a hair shorter than THE GREAT RIFT. Even so, I didn’t get to cover everything I wanted to in this one, meaning there pretty much have to be two more books in the series. Let me know if you’ve got any questions. If not, go forth and read! 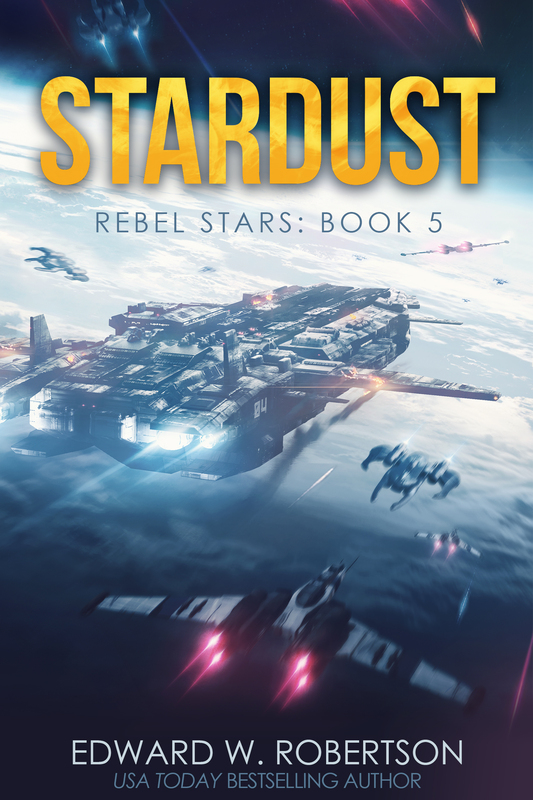 The savvier among you might have noticed that it’s been taking me an unusually long time to finish my current project, the next REBEL STARS book. Well, that’s because I wasn’t writing one Rebel Stars book. I was writing two of them. And I’ve finished the series. Oh, and if you haven’t started the series yet, I’ve also put the first three books in a box set on both ebook and audiobook. And the ebook box is temporarily just $0.99. And all of these are available everywhere. If you’re completely unfamiliar with the series, Rebel Stars is a space opera set 1000 years in the future of the BREAKERS series, where a motley crew must come together to expose—and fight back against—a deep conspiracy that threatens to destroy the human species. Without further ado, let’s get started on the insanely long list o’ links! Fun thing about this book: when I start a series, I usually have no idea how it’s going to end. But one of the very last scenes in STARDUST, right before the epilogue, is something I’ve had in mind since before I wrote a single word of these books. Finally getting to write it after three and a half years of waiting felt pretty special. Onto the box set! This includes books 0, 1, and 2 of the series: REBEL, OUTLAW, and TRAITOR. Like the others, the ebook can be found on Amazon, Amazon UK, iBooks, Kobo, Nook, and Google Play. The audiobook’s on Audible, Amazon, and iTunes. In hindsight, I’m really happy I decided to write these back to back. 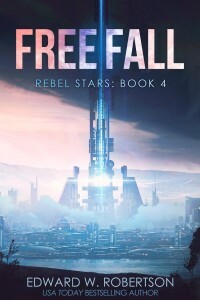 I knew FREEFALL was going to end on a cliffhanger and I really didn’t want to make everyone wait another 12-18 months until I could clear out the time to write and publish the final novel. One of my chief goals is to always deliver the end of a series in a timely manner. I hope I’ve done so for you once again. This has also cleared the decks for me to focus on the CYCLE OF GALAND in 2018. I have nothing else major going on, so I’ll have two new Galand books out year, likely one in the spring and one in late summer/early fall, which means the respective audiobooks will probably be out in the summer and late fall. I’ve already started plotting book #5 and will start the actual writing after I’ve had a few more days to recover from the last six months of work! Is that it? Yes, I think that’s it for now. I very much hope you enjoy the rest of the series. 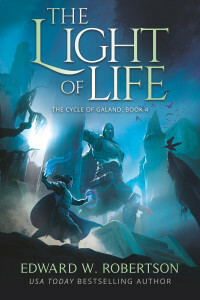 Today marks a bold new day in Cycle of Galand #4 releasing: THE LIGHT OF LIFE, The Cycle of Galand #4, has now been released. You can find it on Amazon, Amazon UK, and paperback. For audiobook listeners, the wait will be shorter this time. THE LIGHT OF LIFE is tentatively scheduled for an August 15 audiobook release. Note this date isn’t chiseled in stone until the preorder’s up, but that’s the plan as it stands. As always, the inestimable Tim Gerard Reynolds will provide narration. Oh, and if you’re new to the series, you can start with THE RED SEA, The Cycle of Galand #1. Or start at the very beginning with THE CYCLE OF ARAWN, the complete epic fantasy trilogy, which retails for a lowly $4.99, or is free to read through Kindle Unlimited. I’ll have some updates on future projects, including further books in this series, in a couple of weeks. For now, go read and be merry, for Elon Musk hasn’t yet invented books that can read themselves. 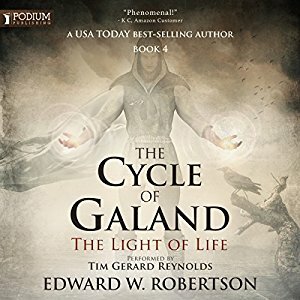 The Wound of the World: The Cycle of Galand #3, Now on Audiobook! Good news, everyone! 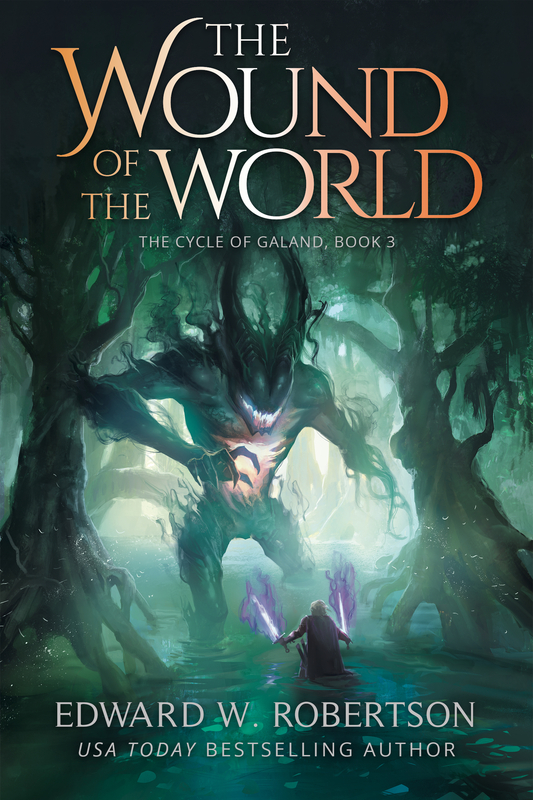 THE WOUND OF THE WORLD: The Cycle of Galand #3 is now out on audiobook! You can find it on Amazon, Audible, and iTunes. As always, it’s narrated by the inimitable Tim Gerard Reynolds. If that’s not enough to convince you to pick it up, I don’t know what will. Threats of violence? No, too far. I’ve got it! Threats of threats of violence. Yes, that should do nicely. Anyway, I know book three had some delays getting into audio, so the double-extra good news for the day is that book four, THE LIGHT OF LIFE, is already being recorded by Tim as we speak. Based on previous production times, I’d expect it out sometime this fall. For the ebook and paperback for #4, I’m still waiting on the cover art, but I’m hoping to have it out mid-late May. That would appear to be all for now. Except for you, who can go pick up 21+ hours of entertainment that is THE WOUND OF THE WORLD all for one measly Audible credit. CAPTIVES: Breakers #6 Live on Audiobook! Sweet news, people of discerning taste. The wait is over. 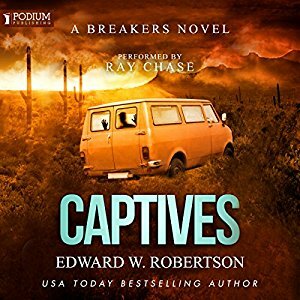 CAPTIVES: Breakers #6 has come to audiobook. You can find it on Audible, Amazon, and iTunes. Want some even better news? Book #7 is scheduled to hit audio in December. And Book #8, the finale, should be out early next year. I expect that the only people more excited to have the full series on audio than I am is you all. 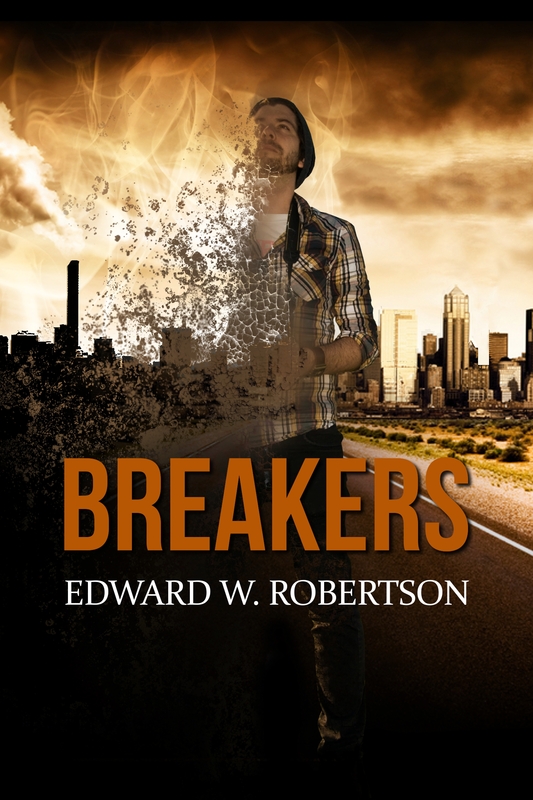 If you’re new to BREAKERS, it’s a post-apocalyptic series about a small cast of characters who struggle to survive as the world ends — not just once, but twice. The first three audiobooks are available together on Audible for just one credit. That’s 42+ hours of listening. At the moment of this post, the set has 1010 ratings and a 4.3 average. With the remainder of the series on the horizon, now’s a great time to jump in. Gosh. With sales pitching like that, just imagine how good the writing in the books must be! The Wound of the World: The Cycle of Galand #3! I am excited, stoked, and chuffed to announce that Dante and Blays are back in the saddle! 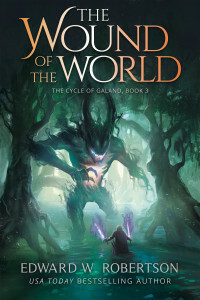 THE WOUND OF THE WORLD: The Cycle of Galand #3 is now live. You can find it on Amazon and Amazon UK. If you’re not a Kindle user, the Kindle app should work on most devices. If you can’t or won’t use Amazon, please email me at edwrobertson AT gmail and we’ll work something out. If you’re a paperback reader, I hope to have that version out within a week or two. By the way, I get the impression a lot of people think this series will be a trilogy. Well how does it feel to be WRONG? Does it feel great? It should, because this series will actually be five or six books long. My intent is to start writing #4 by December (I have something else to wrap up first) and publish it by April 2017. When will the audiobook for THE WOUND OF THE WORLD come out, you ask? Well, I’ve just sent the manuscript off to Podium, the audiobook publisher for this series. Tim Gerard Reynolds is slated to record it next month. After that, it’ll take some time for post-production, and a couple-three weeks to be submitted to and approved by Audible. This is a long-winded way of saying it won’t be overnight. That said, it should be out early next year, perhaps even January. I know Podium will be eager to get rollin’ with it. Speaking of all these things! The Voice Arts Awards have nominated Tim and THE RED SEA for 2016 Best Narrator in a Fantasy novel. Winners will be announced November 13. *glares at VAAs* I’m sure the VAAs will make the correct decision. Getting back to THE WOUND OF THE WORLD, I always feel a certain amount of trepidation publishing a new book—what if I’ve suddenly turned into a pumpkin and can’t be trusted to write a manual for a coffee machine, let alone a worthy sequel to my previous books? ?—but I am, at the moment, feeling pretty good about this one. It expands the world while leading to a story that I think will be pretty epic. Enough blathering by me, either you’re going to buy it or you’re not. My recommendation: get it.